NASHVILLE, TN (WKRN) – If you are a top state official and President Trump wants you quickly for a meeting in Washington about federal regulations, you get up there fast. That’s what happened earlier this month with Tennessee Department of Transportation Commissioner John Schroer. “I thought it was going to be at the White House, but it was at the USDOT office,” the commissioner told New 2. 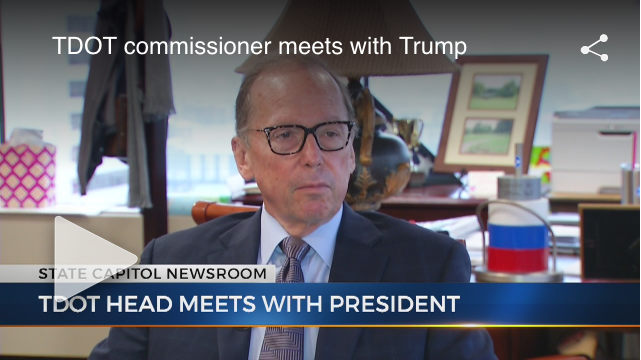 Schroer said he was told it was the first time a president had ever come to the office that oversees the nation’s transportation system. “Part of that is reasoning for that is he wanted to make sure people understood how important infrasture is to his administration.” added the TDOT commissioner. For about an hour at Washington’s DOT offices in early June, Schroer was among eight other state transportation department commissioners who heard the president say just a few feet from them that he wants to cut the federal regulations for road projects that can sometimes take 10 years from planning to finished construction. The commissioner says road projects might have 10 federal permits to obtain individually before construction. He says President Trump wants to save time by getting all the permits at once. “He suggested maybe we should do a one stop shopping. There should be one central clearinghouse for all those permitting things,” Schroer added. Throughout the meeting, the Tennessee Department of Transportation commissioner says he saw first hand how the president works. The Tennessee Department of Transportation headquarters are in downtown Nashville, TN. “He asked a whole lot of questions and started doing some directives to some of his cabinet members. ‘We need to fix this, you take care of this,’” the commissioner recalled. When we hear more about those fixes for the nation’s infrastructure is anyone’s guess, but Tennessee’s transportation saw up close and personal that the president is serious about it.